Australia’s record economic expansion has completed its 27th year. Interest rates remain at record lows; wage and price growth are near 2 per cent; the jobless rate is near 5.5 per cent. View the full screen here or by clicking on the image above. Total returns on Australian shares (All Ordinaries Accumulation index) have lifted by 13.7% over 2017/18 (20-year average +10.8%) to just below record highs. A collection of charts and tables that highlight the path of key economic and financial indicators over the past year. 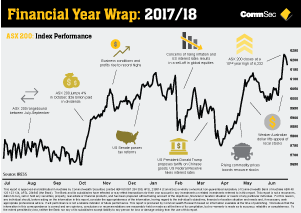 CommSec Senior Economist Ryan Felsman takes a look at the performance of the Australian sharemarket over 2017/18, including the winners & losers. CBA Chief Economist Michael Blythe on the performance of the Australian economy over the past financial year, and the outlook for wages, property prices & global growth.